Who doesn’t enjoy a couple large scoops of delicious ice cream on a hot summer day? I know I do!! Unfortunately, this sweet treat can’t exactly be enjoyed on a regular basis due to its high calorie count. Boooo. I was recently asked to try out a product that was new to me, Arctic Zero. When the box of ice cream was delivered, I’m pretty sure my mom was way more excited than I was to try all 6 flavors that were sent. You see, just like Arctic Zero founder, Greg Holtman, my mom has diabetes and is very careful about what she intakes, especially when it come to appeasing a sweet tooth. She had previously tried one flavor and was expressed that she was more than satisfied. Thanks to her awesome daughter being a food blogger she had the opportunity to not only try one flavor but 6 flavors. Yasss! Lol!! Now when I read the above statement, I thought this ice cream is free from a LOT of things, it can’t be that tasty. And I honestly didn’t think I would want to buy it again. But I was still curious. So on this beautiful Wednesday afternoon we had an ice cream tasting. And friends let me tell you!! Arctic Zero got it right! This ice cream was surprisingly delicious. It was creamy, lots of flavor, and definitely eat-a-whole-pint-by-yourself worthy. I had the opportunity to try five flavors: Cake Batter, Rocky Road Trip, Peanut Butter Swirl, Cherry Chocolate Chunk, Salted Caramel and Cookie Shake. While all of them were very tasty, I did have a favorite. Rocky Road Trip! I enjoyed this particular flavor especially just for the simple fact that there were whole marshmallows in it. I LOVE marshmallows!! And there were quite a few in this pint of deliciousness. I’m a fan! I also loved Cherry Chocolate Chuck. It was sooo delightfully creamy! My mom gave it 2 thumbs up and also gave great praise to Cake Batter. She was actually a big fan of all the flavors! Lol! Arctic Zero uses GMO-free of rBST, a synthetic hormone. It’s also ultra filtered to remove the lactose, a natural sugar found in milk. A small melon from Asia, monk fruit is a natural sweetener that’s low calorie, low glycemic and roughly 150 times sweeter than sugar. 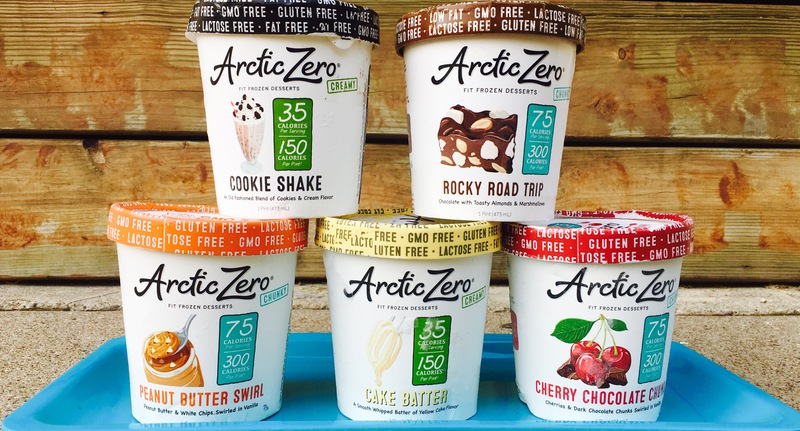 Arctic Zero’s Fit Frozen Desserts are made with chicory root, a soluble fiber known for its prebiotic in blood-sugar-stabilizing properties, and sugarcane, an insoluble fiber that aids in digestion. Arctic Zero contain no monosodium glutamate (MSG) or hydrolyzed vegetable protein (HVP) in their natural flavors. To enhance the flavor of their Fit Frozen Desserts, Arctic Zero added a touch of sea salt crystals collected from the seas of the Pacific Coast. Harvested and milled on the same day, Arctic Zero’s GMO free organic cane sugar is sun sweetened in Florida. Tripled filters and purified for a perfect base. ARCTIC ZERO is available at stores nationwide! To find a store near you that carries Fit Frozen Desserts, check their store locator. Arctic Zero can also be ordered online and delivered right to your doorstep. *I received this product for free from Moms Meet (momsmeet.com) for review purposes. All opinions are my own. Compensation for this post was provided.